A group of tourists came through Costa Rica that had a special addition to the group – a cute little furry calico kitten their tour leader found while she and her group were visiting a local nature reserve. “It was so skinny and lonely, shivering in a corner. I didn't have the heart to just let it whither away without food or anything and I could not find a good Animal Rescue Project in Costa Rica to take it in," the tour leader said. “The poor thing was so hungry. I decided to take him along with us on our tour and my passengers and I named it 'Walter.'" The tour leader became the surrogate mother, nursing the poor little thing back to health. Before Walter became too much of a wanderluster, the tour leader decided to give her up for adoption. When she arrived to La Fortuna, Greg Reeser of Desafío Adventure Company decided the little Walter would make the purrrrfect addition to his home. “My daughter Sophie had been wanting a kitten for a long time now," Reeser said. “I was more than happy to help out. And Sophie fell in love with her new kitty immediately." It's hard to know why Walter was abandoned. Although Costa Rica has a pretty good culture of taking care or personal, household pets, there are still plenty of stray dogs and cats that wander the streets and rapidly reproduce and lacks funding for legitimate Animal Rescue Projects in Costa Rica. San José-based SASY! (Stop Animal Suffering Yes!) is a non-profit organization dedicated to spaying and neutering cats and dogs, promoting animal welfare and educating pet owners about animal protection in Costa Rica. SASY! was founded to obtain and distribute funding to raise awareness of animal abuse and neglect and support the tireless efforts of the many groups and individuals who are working diligently to make life better for animals in Costa Rica. SASY! reports there thousands of homeless cats and dogs in Costa Rica. Many of them are unhealthy and pose a public health threat. 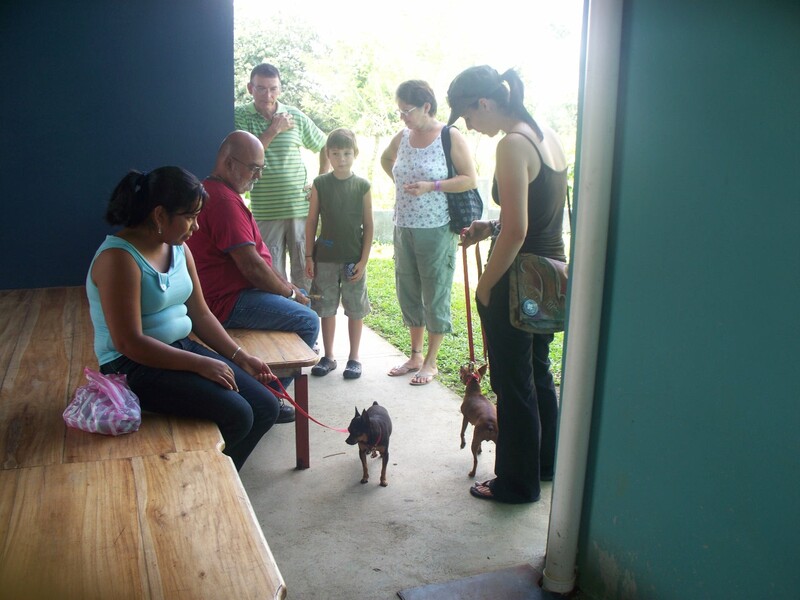 “It's funny how the local street dogs can pick out the foreign tourists," Teresa Barquero Montero, principal organizer of bimonthly spay and neutering campaigns in the popular tourist destination at the base of the Arenal Volcano. “The dogs know that foreigners have a soft spot for animals, so they follow the tourists around hoping for scraps," Barquero said. “In fact, I've even seen some tourists fall in love with a stray and actually make the proper arrangements to have it shipped back home with them," Barquero said. Nearly 40 stray dogs and cats were spayed or neutered during a recent community campaign organized by the charismatic Barquero. For each campaign, she invites Veterinarians to perform the operations at a discounted rate. Several pet owners also participated by bringing their animals in and sharing in the costs of the surgery by donating c5,000 each. “We still need to learn a lot more about proper pet care. 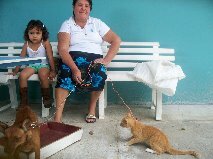 Spaying and neutering is the first step," Barquero said. This year the local pro-animal crusader received very welcomed funds from SASY! to help with the costs incurred in rounding up the strays. Part of the funds came from Desafio's People + Planet = Prosperity project funding source. 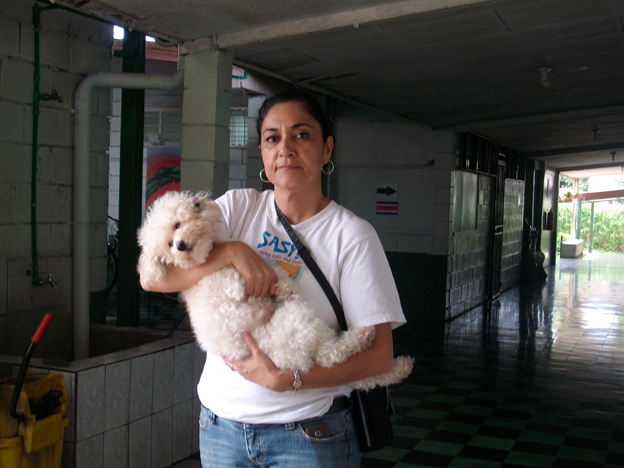 “They should put up a plaque for Teresa," said Melissa Solís Varela, a local supporter of the spaying and neutering campaign. “She's done so much to help clean up this town and prevent the over population of strays." So whether you're a stray cat like Walter or a household dog in La Fortuna, there's someone looking out for you! Feel free to help us support the efforts of SASY! in Arenal, Costa Rica.